Heat oven to 375°F. Gently unroll pie crust. Place crust in ungreased 9-inch pie plate. Press crust firmly against side and bottom. Trim crust along pie plate edge. In large bowl, toss cherries and sugar to evenly coat. Add flour. Toss to coat. Spoon mixture into pie crust. Place second crust over filling. Wrap excess top crust under bottom crust edge. Press edges together to seal; flute. Cut small slit in top for steam to vent. Bake 40 to 45 minutes or until crust is golden and mixture begins to bubble. Cool 15 to 30 minutes on cooling rack. 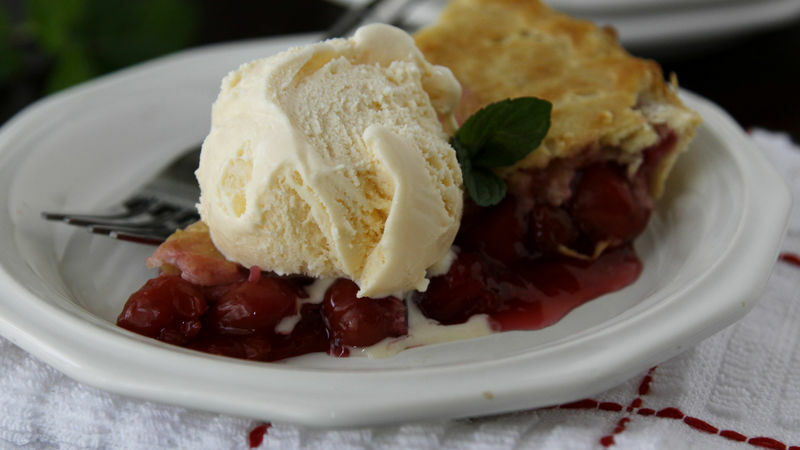 Substitute frozen cherries if you cannot find fresh. Weave a lattice top for the pie for an extra-special presentation. Serve with ice cream and/or fresh mint. After first 15 to 20 minutes of baking, cover edge of crust with strips of foil or a pie crust shield to keep edges from browning too much.